HIGH DENSITY 5.25 lb to softer 4lb viscoelastic Memory Foam!! Revolutionary breakthrough in foam technology. The visco-elastic foam shapes itself to your head and neck. A variety of conditions such as headaches, neck pain, back pain arm and hand numbness can be helped with proper Cervical Spine Support. Memory foam is a very dynamic material and sizes will vary slightly. Revolutionary technology shapes to the head and neck. It reacts to the temperature of the body to form to the head and neck, giving proper support while maintaining softness. Helps with Headaches, Neck Pain and insomnia. Hypoallergenic, antibacterial/fungal. We now offer three different densities for your personal preference. Vitalfoam 5.25lb - A true dense viscoelastic memory foam (marshmallow like feel) that is comparable to the mall brands. Vitalfoam 5lb - a softer less dense viscoelastic memory foam with less of a marshmallow feel. Vitalfoam 4lb - softest density viscoelastic memory foam. VITALFOAM CUSTOM MEMORY PILLOW FULL (QUEEN) (24x12x4" *) Compare at $125. VITALFOAM CUSTOM MEMORY PILLOW THICK (20x12x5" *) Compare at $125. 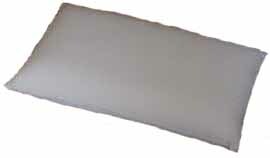 VITALFOAM CUSTOM MEMORY PILLOW FULL/THICK (24x12x5" *) Compare at $150. *Due to the pliability of viscoelastic memory foam products, measurements can never be 100% accurate and may vary slightly.